One great temptation when writing an article or a book is to try to say it all. There is so much we want to share, we don’t want to leave anything out. Great way to hide our primary message. Also a great way to chase readers away. I recommend that you prayerfully select your topic. Then the part of that topic you want to zero in on and what audience you want to address. Ask yourself, what do I want the reader to take from this? Then focus your outline and every part of your writing on your choices. You may think . . . Well, this point wanders a bit from my topic but it’s so important. I want to share it! I need to share it! Don’t. Save it for another article, another book, when it is on target for your topic. Stay focused! 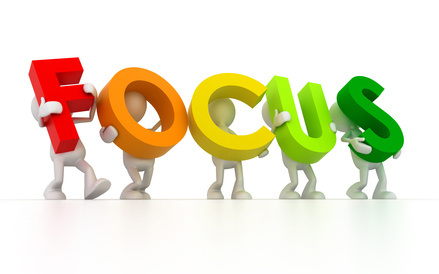 “Focus is the Feature of Effective Writing that answers the question ‘So What?’ An effective piece of writing establishes a single focus and sustains that focus throughout the piece. Just as a photographer needs to focus on a particular subject to produce a clear picture, a writer needs to focus on a single topic or main idea in order to produce an effective piece of writing.” (Kathleen Cali) Read the rest of Cali’s informative article here. Choose your topic. Choose your audience. Decide on desired take-aways. And focus.